Robert H. Hoke Post 272 Honor Guard provides one of the most visible and important community services to our veterans and their families. Annually, Post 272 Honor Guard participates in various Patriotic Holiday Celebrations. Memorial Day is one of the most important holidays to the veterans community and to Post 272. 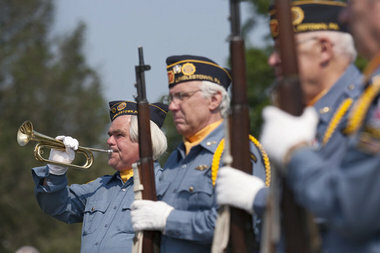 Steve Trimmer, left, plays taps during a Memorial Day service at the star memorial at Blue Ridge Cemetery. Members of the American Legion Post 272 Honor Guard from Linglestown made 18 cemetery stops on that Memorial Day. In addition to various Holiday observances, the Honor Guard is available to provide Gravesite Services. Our Post Honor Guard has been very active during these past years. Annually we participate in Patriotic Holiday events, the single largest of these being the Memorial Day weekend celebration. Memorial Day includes many activities and service projects, with several special ceremonies, these ceremonies are very meaningful services for everyone who participates or attends. The Memorial Day Parade usually is the highlight of the day, the Parade is followed by local speakers, and is always well attended and received by the community. The Honor Guard was proud to have a contingent marching in the last Memorial Day Parade and look forward to this years Parade with anticipation. We could use a few more of our younger members choosing to become active in the Honor Guard. Remember, it’s for the veterans we do this.